Told ya this week is SO busy! So many things going on and everything is moving a million miles a minute. Thanks to everyone who came out to the Twitter party last week. It's so fun to be able to chat with everyone in real time. We touched on all of the big TJ Maxx trends for spring like color, boho, feminine, and fashion whites and I also heard a ton of stories from you guys about your fab Maxx finds. Reminder that the contest to win a 1k gift card is still going on so don't forget to enter if you haven't already. Let's continue the conversation shall we? 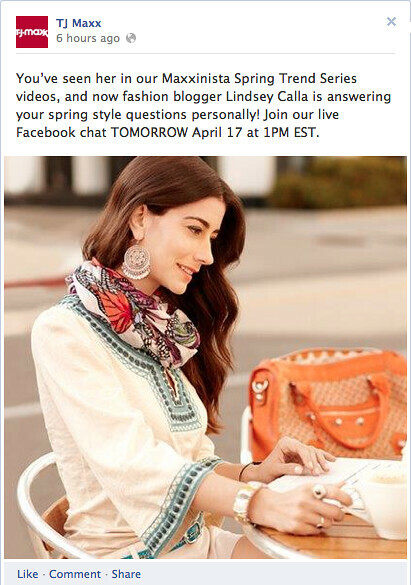 Tomorrow I'm hosting a Facebook party with TJ Maxx from 1pm-2pm EST on their FB page. What's cool about this is that the questions are coming from YOU so feel free to ask anything from general styling tips/conundrums to top secret shopping strategies. I'll be there to answer!